Packing for going on a vacation that requires flying with both a toddler and a baby should seriously be considered as becoming an Olympic Sport! Contests for who can fit the most in their carryon, how to talk your way through airport security with your toddler's favorite snacks, navigating the airport with a double stroller and changing a diaper on a jet plane would draw sellout crowds and fierce competition. But seriously, with the baggage limitations most airlines impose nowadays, getting everything you need on board with you can be seriously challenging. And forget it if you aren't purchasing a seat for your child. If you are having your baby lap sit, you'll need to fit both yours and your baby's stuff into one suitcase (maybe two depending on the airline) and still possibly incur extra baggage charges for overweight bags or bringing on additional ones. So a traveling mom must be a creative mom. Before packing your children's bags for your next trip, take the following tips into consideration. Use grocery store delivery. Many vacation spots have large grocery stores that deliver everything from diapers to detergent. Do some research to see if there is a local grocer that delivers where you are staying and order what you can for delivery prior to departing for your trip. Better yet, if you are staying with friends or family, email them a shopping list, transfer funds from PayPal and ask them to do the shopping for you. Rent what you can. Baby rental shops are stocked with gear, toys, linens and other items that you may want to have with you but can't bring along. Many will deliver and even set up items like high chairs and pack and plays for you. Ship a few boxes. 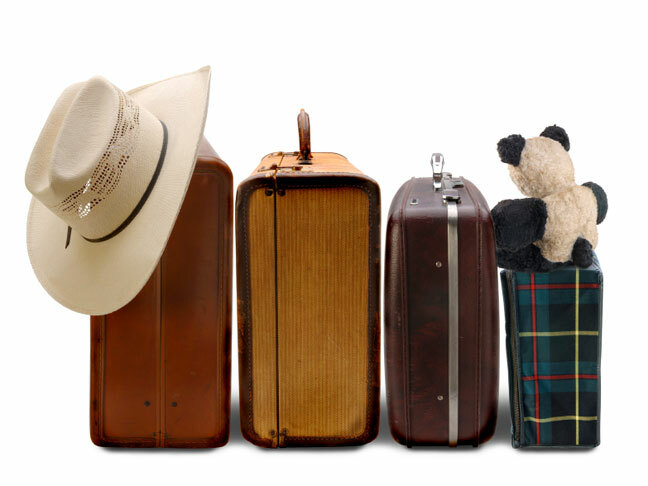 If you know you'll be needing more than you can pack without having to pay an extra baggage fee, consider shipping a box or two of items down in advance of your trip. Inquire to where you are staying about how packages are handled. If you are visiting friends or family, shipping directly to them may save you the handling and storage fees that some hotels and resorts charge. Opt for lodging locations that offer an in-room washer and dryer. This can significantly help you scale back what you need to pack for clothing. Pack at least two days worth of clothing, diapers and supplies in your carryon bag. Placing each outfit in a Ziploc bag can help keep your bag organized. Having enough stuff to get your through a day or two can be essential, especially if you were ever to get trapped on the tarmac. Make three piles: your must haves, would like to haves and can live without. Cut out the last pile and wean down your would like to haves as much as you can. While traveling and flying with young children can be a challenging task, with a little planning and preparation it can be accomplished. What are your trips for traveling with little ones? How do you handle packing for trips that require air travel? Share your best tips in the comments below.